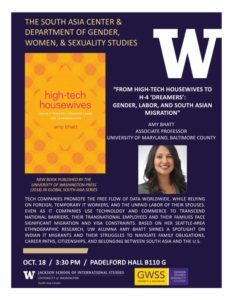 Lecture at the University of Washington | Amy Bhatt, Ph.D. Thank you to the Gender, Women and Sexuality Studies department and the South Asia Center at UW for hosting me. I presented on High-Tech Housewives and my new research on South Asian immigration activism. It was a packed house!